Chick here for a detailed listing of Breathing Air Quality Limiting Characteristics and specific Respiratory Protection Program requirements. Because of the health and safety importance of the breathing air analyses all work is performed by a Certified Safety Professional (CSP) and analytical results are available 24 to 72 hours following sample receipt at the laboratory. After the review and approval of the analytical data, if it is determined that any tested characteristic exceeds the appropriate Breathing Air Standard the client or data user is immediately notified. If all characteristics meet the appropriate standard the Analytical Report and Certificate of Compliance is sent to the client. Compressed breathing air sample collection is a critical aspect and relates to the data quality produced in the laboratory. Sensitive laboratory instrumentation cannot reconstitute the integrity of a sample improperly collected. 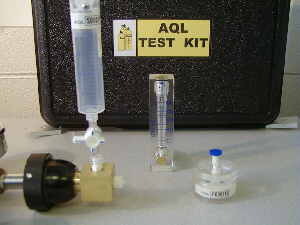 AQL has developed the AQL TEST KIT as an easy and economical means of collecting samples from a compressed breathing air source that meets the requirements of CGA/ANSI G-7.1-2018. Contact AQL to start your Breathing Air Testing Program today. For more details on Fire Department RPP requirements click here. With the expertise of a Certified Safety Professional (CSP), AQL can assist you with the evaluation or development of the required written Respiratory Protection Program and SCBA SOPs. For additional SCBA SOP information click here. AQL will custom write the program and procedures tailored to the department's equipment and practices. These prices include all tests required for Grade E or NPFA 1989 specifications AND rental of the AQL TEST KIT for collection of your compressed air source. NO initial capital expenditure is required to buy the sample collection kit, however, the kit is available for purchase. Purchasing and having the kit on hand may be desirable if; you require immediate sampling, you sample multiple locations throughout a given month, or you sample at a frequency greater than quarterly. In these situations it is more economical to purchase the sampling kit. For must clients, however, who have established a routine monitoring program of quarterly or less frequent it is more cost effective to use the AQL rental kit. If you already own another lab’s sampling kit, contact AQL to discuss conversion options. It may be possible to convert the kit for use with the technically advanced AQL gastight sampling syringe system. This will allow you to take advantage of the superior AQL collection system and lower AQL analytical testing fees. Copyright © 2018 Air Quality Laboratories, Inc. All rights reserved.